The ATP pulse-echo ultrasonic time-of- flight (TOF) measurement device; measures, displays, stores and transfers bolt load and elongation data in a new, single purpose unit. The ATP ultrasonic uses a rugged, sealed color touch screen for all operator I/O. The screen uses proven medical touch panel hardware. The measurement system is a hybrid technique, using the best of both analogue and digital signal processing techniques for fast signal acquisition and precise single shot TOF measurement. All data is logically presented on a 4.3” color, resistive touch screen, usable with gloves. Data and digital signal traces are stored for later display and transfer. 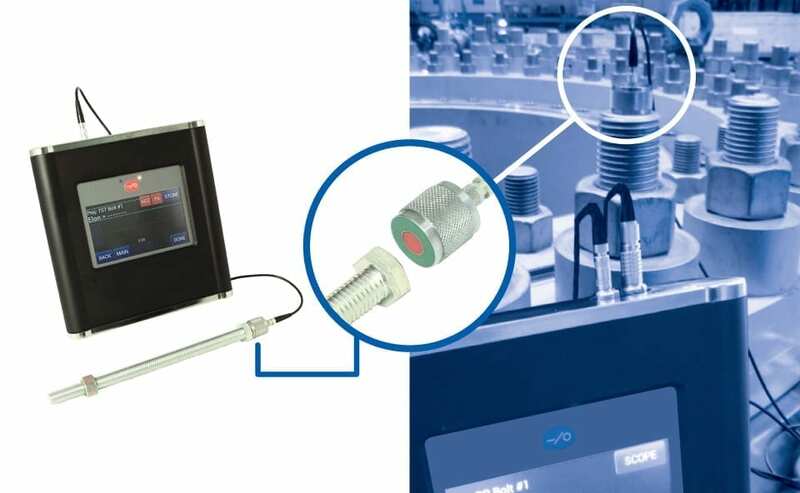 The unit has automatic temperature compensation through an included magnetic temperature probe. The novel memory system has a secure sector for all bolt data and a “public” sector for transfer via USB to computer. The ATP ultrasonic is powered by proven Li Ion batteries or through dual charger inputs: fast charge standard external 9V supply or the waterproof micro USB connector from any standard 5V USB device, battery pack or power supply. Intuitive software developed specifically for bolting industry, the automatic echo detection algorithm has been developed with input from the most experienced users and electronic developers in the bolt tightening industry! Communicate to any PC with standard USB connection. • No buttons or confusing arrows and abbreviations, programmable touch pad QWERTY alphanumeric input. • No special PC software required. Once connected to the PC, the ATP ultrasonic runs as an external hard drive for easy file management. • Flexible bolt data storage options, large storage. • Store and display echo traces of every signal for every reading, date/time stored with each reading. • Can be used with magnetic, non-magnetic and glue-on transducers. • Special, modified and custom designed transducers are available. • 4 sealed Li Ion 18650 cells, twin smart chargers and fuel gauge chips.